Frozen vegetables are an easy way to include more nutrient-rich foods in your diet. They are convenient, have a long shelf life and cook quickly. Frozen vegetables are often picked at the peak of ripeness and flash frozen, to preserve nutrients and prevent spoiling. So, they have much of the same nutritional value as fresh vegetables. 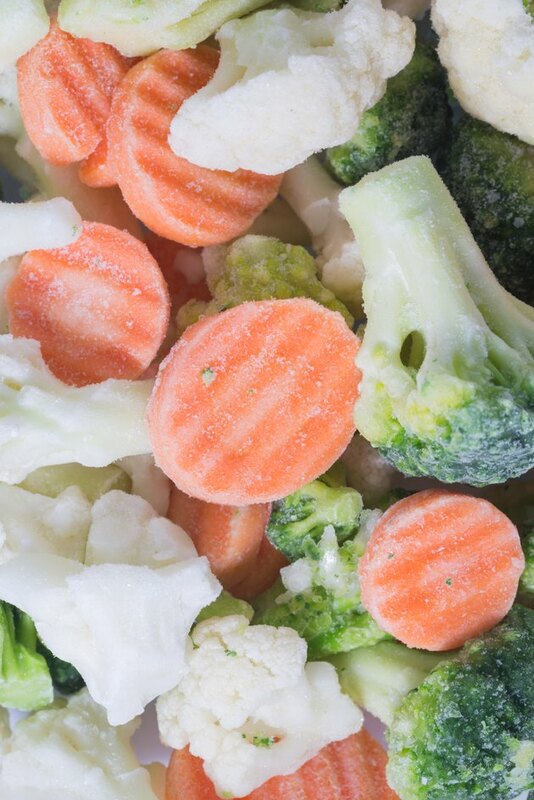 If you purchase frozen raw or lightly blanched vegetables, you may want to cook them and re-freeze them so they are that much faster to prepare for a quick meal. This process requires some strategy so that you do not lose too much quality or essential nutrients. Thaw your vegetables in one of three ways. Set frozen vegetables in the refrigerator for slow, safe thawing that takes several hours or overnight as your first option. Immerse vegetables, encased in plastic wrap or a glass container, in cold water that you change every 30 minutes as a second option. Or, microwave the vegetables, which have been removed from their packaging, and process them on defrost – about 30 percent power – according to weight as a third option. Saute, steam, boil or stir fry the vegetables as you prefer. Add herbs and spices, if desired. Avoid adding butter, oil or creamy sauces, which do not freeze well. Remove any excess water and spread the vegetables in a single layer on a cookie sheet or freezer-safe tray. Allow them to cool slightly. Freeze the vegetables as fast as possible to maintain quality and prevent the formation of ice crystals. Use a quick-freeze shelf if your freezer has this feature. Avoid stacking the trays, which will slow down the freezing process. Repackage the vegetables in freezer bags or glass containers for easier storage once they are fully frozen. If you have leftover thawed and cooked vegetables in your refrigerator, you can freeze them within three to four days, but they may not taste up to par. If you prefer, you can sauté, boil or steam most frozen vegetables without thawing them first. Corn on the cob is best thawed in the refrigerator or in cold water before cooking, however. Leafy greens, such as spinach, do best when soaked in cold water, or they may release too much water into your recipe. Do not thaw foods, including vegetables, on the counter or outside. This invites dangerous bacteria, which can lead to food poisoning. If you thaw vegetables in the microwave they reach a high temperature that invites bacteria, so you must cook them immediately to preserve quality and prevent food-borne illness. If you have left your vegetables outside of the refrigerator for more than two hours, discard them, as they may have developed dangerous bacteria. Eating Well: Fresh vs. Frozen Vegetables: Are We Giving up Nutrition for Convenience?